Elizabeth Warren’s Proposal for “Co-Determination”: Really a Second New Deal? Very large American corporations must obtain a federal charter as a “United States corporation,” which obligates company directors to consider the interests of all corporate stakeholders: American corporations with more than $1 billion in annual revenue must obtain a federal charter from a newly formed Office of United States Corporations at the Department of Commerce. The new federal charter obligates company directors to consider the interests of all corporate stakeholders – including employees, customers, shareholders, and the communities in which the company operates. I urge you to read the one-pager in full; there are other provisions as well, including a neat strategem of class warfare that would set fire to reams of the 0.1%- and 9.9%’s paper wealth, but the directorships and charter revocations are the topics I will ultimately critique today. Let’s remember what a corporation actually is: It’s a legal entity, i.e., one constituted by government laws. The government defines the parameters of what a corporation is. To “incorporate” is to form the kind of entity that the law provided for, and to accept the rights and responsibilities that are outlined in the statute…. If Kevin Williamson thinks Elizabeth Warren’s proposal is dictatorial, just wait until he sees the Delaware incorporation statute, the law that defines how a corporation works. It tells corporations how their officers are to be selected, who has liability for what, what powers the stockholders have. It even tells them how often they have to have meetings! Dictatorship! Slavery! The road to serfdom! So, if the nation decides that shareholders should not be the only corporate stakeholders whose interests are to be taken into accout, legislation requiring that is well within the remit of the State, and always has been. That’s how they do things in Germany, after all; a not unsuccessful capitalist nation-state. Codetermination is deeply rooted in the tradition of German corporate governance and has existed in its current form since the Codetermination Act of 1976. It has an explicit social dimension: as the German Constitutional Court ruled, codetermination on the company level is meant to introduce equal participation of shareholders and employees in a firm’s decision making and shall complement the economic legitimacy of a firm’s management with a social one. Codetermination could be viewed as an institution enhancing workers’ representation and participation rights in a firm’s corporate governance. There are two levels through which employees are given codetermination rights to participate in a firm’s decision making: [a] the work council (“Betriebsrat”,establishment or “shop-floor” level) and [b] the supervisory board (“Aufsichtsrat”,company level). Note that Warren’s Act operates only at the [b] board or company level, not at [a] the shop-floor level. (This is why Kevin Drum’s question — “Codetermination? Why Not Just Powerful Unions Instead?” — is misplaced; the shop floor is not in the scope of Warren’s Act, and unions would presumably manage that.) We’ll get to the implications of that when we look at co-operatives. I would sharpen Meyerson’s point by saying that Sanders’ policies — provision of services like #MedicareForAll or free college — make him a social democrat; but Warren’s Act — empowering workers, albeit partially, to allocate capital through co-determiation as directors — place her on the road to democratic socialism, if that be defined as democratic control of the means of production. Of course, it’s unlikely that Warren will go very far down that road, but that’s where the road leads. And speaking of democratic control of the means of production, there’s another approach that is, if not on the table, at least in the air: Worker’s co-operatives. 2) Unlike FDR’s New Deal, Warren’s Act provides no way to strengthen union capabilities on the shop floor, whether for organizing or anything else. 3) As FDR’s New Deal saved capitalism, so might Warren + Sanders. Whether this is a weakness or a strength I leave to you. That does not, of course, mean that either the 0.1% or the 9.9% will support it (“Come along. We’re going to the Trans-Lux to hiss Roosevelt“). (A) 40% of its directors are selected by the corporation’s employees. What’s the rationale for 40% of the directorships? S.2065 has, I believe, 33%. Why not 45%? Or 50%? Or 51%? Or 60%? Has the 0.1%’s performance on capital allocation — I’m thinking of all those McMansions with styrofoam pediments before the Crash, but I could be thinking of Juicero, or Uber, or moving our industrial base to China — really been all that great? (B) A United States corporation that engages in repeated and egregious illegal conduct may have its charter revoked. On charter revocation, I believe “may” should be struck out and replaced with “shall.” That’s the best way to handle repeat offenders like Wells Fargo (or Countrywide (or Promontory)). As in “legitimacy crisis”? I don’t know the political background for the Codetermination Act of 1976; here is the legislative history. Although unions, as representative bodies, clearly have problems of their own; see the Teamster’s support for a two-tier wage system, rejected by shop floor stewards. Idea: Dukakis is tan, rested, and ready! I view “ism”s as means, not ends, including capitalism, and socialism. This entry was posted in Corporate governance, Free markets and their discontents, Guest Post, Politics, The destruction of the middle class on August 20, 2018 by Lambert Strether. How about putting any corporation’s existence to periodic popular votes online? Seriously. These ghastly outfits exercise far more control over our daily lives than government at any level, and yet we have no say. Why should any of us be forced suffer the malevolent presence of these utterly artificial, supremely privileged and empowered entities if we collectively decide that we’re sick and tired of them, they’re harming us or undermining the country? It’s all bull…corporations get to write every dime off on their taxes. We as humans should be able to do the same..food, housing…etc. anything and everything required to live and stay alive should be fully deducted from our income as “operating expenses” before calculating income to be taxed…just like corporations. If they want “citizens united” which gave corporations the power of “$peech” then we should be equal to corporations in tax deductions for “operating expenses “ WAKE UP PEOPLE! This is a game and WE ARE LOSING! >40% of its directors are selected by the corporation’s employees. Don’t get me wrong, I do *like* where this is going. Do you realize though that there are corporations umbrellaed under umbrellas under further umbrellas? And that the uppermost umbrellas have minimal, sometimes a single employee? These people don’t seem to sleep if it interferes with finding ways of stuffing their pockets and ensuring they get away with it. It might prevent corporations from buying each other in order to crouch under $1B of revenue. Which might not be a bad thing. Agree with Lambert that an “Or EmployeeCount > SomeNumber” clause would be useful to add. But only if EmployeeCount includes all those pesky subcontractors, temps, and 1099s. One more item I don’t see mentioned in the article is a requirement for 75% of the directors and shareholders to approve public policy lobbying / political participation…in effect giving that 40% selected by workers a veto (subject to whatever co-opting, bribing, etc…connivance is not the monopoly of the moneyed classes). The one thing I don’t see? Not one politician is saying each and every US citizen has Lost $70,000 in the 2008 crash, not one corporate executive has been charged with a crime, and thousands of people lost their homes. Instead guilty bank executives got huge financial bonuses. This will happen again soon and it will be worse next time due to the fact the banks are even bigger now than they were in 2008. So whatever…let us all stick our heads in the sand and pretend ELIZABETH WARREN or any other person in office at this very moment is relevant and working for our best interest. 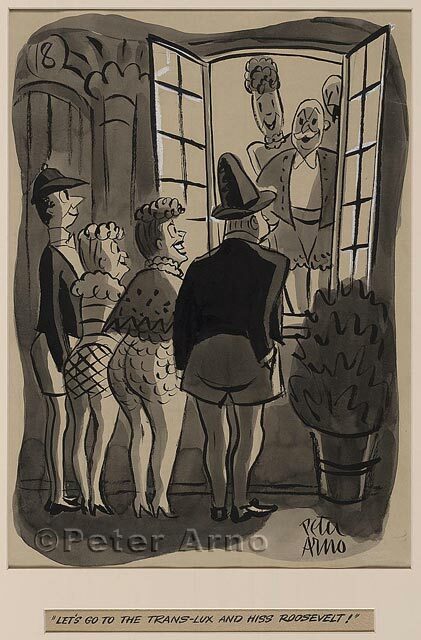 The original 1936 Peter Arno cartoon is much better – and more appro. How about limiting political expenditures to actual real persons (i.e.people) & getting corp. money out of political campaigns? I think there’s a place for political advocacy/expenditures by unions and non-profits like the Sierra Club, the ACLU, or the American Humane Society. I’m not sure it’s possible to write a legal definition separating such advocacy groups from corporations which wouldn’t be gamed immediately by major corporations. The requirement for a heavy majority of shareholders or members to assent to political expenditures would allow citizens to come together for public policy purposes while keeping the leaders accountable to the membership for their use of funds in these efforts. AARP should be included in that list, as an exemplar of political advocacy/expenditures that are nominally, I guess, protected by stuff like “Citizens United” against “regulation.” Regulation being that process that, in our own bodies, keeps temperature, electrolytes, glucose levels and the other bits of physiology under control, driven toward a healthy state of the individual. Lack of regulation gives disease, cancer being one of the worst, where the regulatory system is tricked into not acting to halt the deadly processes. Elite things, also morphed into a brand and attachments though the local organization (which reflects unfortunately the fractioned, “issue”-and-identity-centric, “let’s you and me discuss making a coalition” flip-charting of local “liberal” congeries. We could do better? Actually, “political expenditures” is simply too vague. Does this include lobbying? PACs? > How about limiting political expenditures to actual real persons (i.e.people) & getting corp. money out of political campaigns? Currently it’s easier to get a law through Congress than amend the Constitution or knock off a few SC Justices, which is the alternative. How you gonna keep ‘em down on the farm, anyway? There’s nothing to keep the thing that is a corporation, a bunch of people under the rule of an executive elite, driven by Greed and Moarism and buy-in and fealty, by the lower mopes and functionaries, to the corporate drives, from moving its domicile Hitherland to Yonderstan? As in those “inversions,” https://www.washingtonpost.com/news/wonk/wp/2014/08/06/these-are-the-companies-abandoning-the-u-s-to-dodge-taxes/?noredirect=on&utm_term=.0754fbf69978 ? And how about those M&As that give the Great International Lawyer LLCs and such so much lucrative billings, and result in a merged entity ‘headquartered” in one of the flag-of-convenience ‘sovereignties” who bid down, in another race to the bottom, fueled by corruption, the costs of “locating” there? Yaas, Warren the liberal activist will be “fighting” to “rein in” structures that already can dictate or bribe their way to getting policy “preferences” effectuated, and forcing legislation, like de-regulation and tax deals and anti-humane stuff, through the “legitimization” (root word “lex,” as in “law”) processes that we all accept as conferring Power via electoral “outcomes” that said corporation entities have so much dollar=vote power over. I’m thinking the horses and cows have long since left the barn, aided by the actions of the Imperium that shows the face of corruption and the devastation of “sovereignty” to the world, day after day. I’ve lost much of the enthusiasm I once had for Elizabeth Warren. I don’t know whether I could get it back for 2020. Her progressive inclinations seem more chimerical than actual. As for her proposed bill for “Co-Determination” I think the devil will hide in the details. With bills running into the hundreds of pages I have grown wary of all bills. Besides, what good are new laws requiring Corporations to play “nice” for everybody’s benefit if there is no enforcement? Didn’t we already have some laws not that long ago that worked reasonably well when they were actually enforced? I’m not against requiring Corporate Management to “consider the interests of all corporate stakeholders” but don’t they do that already before they decide they don’t care about any interests beyond their own bonuses and paychecks? The third bullet point in the summary of the bill which compels directors and officers of United States corporations to hold shares for at least five years after receiving them or within three years of a company stock buyback sounds good but again the devil hides in the details. The verbiage “Very large American corporations” in the first bullet point might be one of the first points where the devil hides. Many very large “American” corporations seem quite ready to become something different given a nudge like this bill. Is there some devil hiding in this detail? The phrase “Second New Deal” sounds too much like “Morning in America”, “Make America Great Again”, or “Change You Can Believe In”. What chance does S.3348 have in the Congress we have today? It’s easy to propose something you know has the same chance a snowball would get in a Death Valley Summer. You make a good point, especially given the lax enforcement of anti-trust. I agree with you long wordy bills that no one reads is a huge problem and less than thrilled with Warren after putting so much hope in her previously. Google the following “Dod Frank bail in” ….you will be unpleantly surprised that WARREN APPROVED THIS. WAKE UP PEOPLE! I don’t want to be a killjoy regarding the principles and ideas here, as they seem laudable and would move discussion if not actual laws in the right direction. Every time I’ve read about this I’ve had knee-jerk “devil is in the details” reactions. This is good, but it needs to be better. I also know airline employees who you’d associate with a major airline, only to realize that so many major airlines use local carriers which are distinct entities legally. The granularity of the companies in question matters as to the $1 billion threshold. Split a company into many pieces which work entirely together and it’s possible to squeak by under the $1 billion threshold, I imagine. This is, of course, not as easy for companies which are publicly traded. Corporate ownership shenanigans could be used strategically to avoid having to comply with this legislation or to water down its effects. As with any bare number thrown into legislation, the chosen 40% of directors demands an explanation. It almost seems natural to start at 50% and dare anyone to argue… this feels pre-compromised. All of this is to say that these details are well worth fighting over, and anyone who doesn’t fight in that arena risks watering such legislation down to the point where a latter-day Karl Rove (from any party) can drown it in the bathtub. I see Warren offering up good ideas and a framework which must not be populated by those friendly to business and hostile to labor. Someone should pull her left on these numbers and potential loopholes — in the light of day, screamingly so — as inevitably the vast majority of the GOP and Democrats will endeavor to pull to the right. +1. I think it’s a great idea, but Liz is negotiating like an Obama dem, which makes me question her seriousness here. If it starts out at 40%, and “may have their charter revoked”, then where the hell do we end up? You noted the potential for loopholes. One thing I noticed was the difference between whose interests Warren claims the “pre-shareholder value” era corporation had to take into account: workers, shareholders, business partners, etc., and the arrangement Warren is proposing. She adds in “the communities in which they operate”. This is a huge addition, yet Warren never refers back to it in any way. This needs to be fleshed out and brought to the front of this proposal, IMHO. It almost seems natural to start at 50% and dare anyone to argue… this feels pre-compromised. The 40% struck me as not exactly arbitrary but just enough for Sen. Warren to claim she was fighting for—or “fighting for”—“substantial” representation while being not enough to make any difference in what might be the real world of actual votes, if we assume that the members of the board will vote along non-employee/employee lines. (I would be curious to see how boards of directors selected in accordance with principles of co-determination actually do vote.) It would make more sense if 50% of the directors were selected by the employees so that a deadlock (or even the threat of a deadlock) would force both sides to reach some mutually acceptable alternative. Look, the bill becomes important if the House is Democratic after 2018, and necessary if the Senate is also Democratic after 2018. Then it becomes a challenge to Trump to either sign or veto. I think there’s a good chance it would be passed in these circumstances. Warren may be betting that the bill gets vetoed if these circumstances hold (D control of congress). In this case, it was a trial run. But if its tried and failed, it gives impetus for a platform in 2020. And then the realities and consequences of the bill can be debated and changed. The bill isn’t quite serious, but serious enough. Obviously it partly there to bolster Warren’s own run for the presidency. But also it’s there as a “thought piece” for further discussions. I take the Medicare-for-All legislation proposals to fit a similar plan. Thanks Lambert for a very thoughtful analysis. Great point. By charter definition, a corporation should not be allowed to outsource its staffing. Isn’t the premise that this entity is so large and robust that it can support these types of large scale management? Then again, we are talking about provisions and legal rules that a competent government, not completely subverted by said entities and money would make. I voted in my first election in 1974. Except for one “strategic” primary vote for a GOPer so I could vote against Poppy Bush twice in the same year and one vote to dismiss a Dem Senator who had overstayed his welcome, all Democrats. In that time average income/wages, however calculated, have remained the same for working people in inflation-adjusted dollars. Manufacturing has all but disappeared in favor of contingent “gigs.” All this, under a succession of national Democrats now d/b/a as Clinton Obama Pelosi & Schumer LLC. I’m done with them all, at the national level. Elizabeth Warren is nothing more than the incoming partner of the same limited liability firm. Pity. My sense is that Elizabeth Warren can visualize issues in a multi dimensional fashion. So are there any prelim concepts floating around her camp, yet to be fleshed out, that would prevent a simple corporate outsourcing/offshoring strategy to bypass these requirements. Maybe it’s how they’ll define “US corporation”. It’s obvious it can’t be as discriminatory as it seems on its face…. or maybe its just an attempt to initiate a serious national discussion. PS- I AM sick of the evisceration of many quality corporate employers that’s taken place during the past few decades, all the while with the chant “maximizing shareholder value” droning on in the background. Regulatory arbitrage on an international scale would be a problem, which is why treaties such as the TPP should not be signed. Without such treaties, foreign corporations would have to do business in the US subject to the terms of such a law. See Google and its problems with the EU. As to the futility of this expressed by some commenters upthread, you have to plant your flag somewhere. If you don’t, you’re acquiesing to whatever comes, which can include treaties which remove any chance for the democratic exercise of national sovereignty. See Greece and the EU. Nothing to do with her Accountable Capitalism Act, but here is a link to Kyle Kulinski today critiquing Warren’s Seth Meyer’s appearance. Remember what ever they call it…it will be the opposite. They know most people will not read the whole document. Paris Accords was perfect example. I read it 5 times. Read it aloud to people and asked them if they would sign it…THEY ALL SAID NO AND EXPERSSED SHOCK AT THE LACK OF ACCOUNTABILITY AND COST TO USA. THE LARGEST Cost FOR ALL OF IT WOULD BE ON YOUR USA GRANDCHILDREN$ backs. A better policy would be true “value economics” example: cost of nail polish includes cost/ impact on environment for production and disposal. Yet we still have Deutsche Bank, don’t we? So because there’s corruption, the US shouldn’t try to legislate better outcomes for workers? Sane politics begins with the acknowledgement that corruption is a given factor, not an impediment to doing something. Of course the US also needs stricter laws in re corporate regulation and courageous federal and state enforcement of laws by judicial offices. I’m arguing that one should always be careful what you wish for. Worker participation demonstrably does not guarantee better corporate behaviour. Codetermination almost certainly gives labour a bigger share of the pie. But that pie might well still be made from rotten fruit. To give a real-world example, a landfill operator might have a board-level decision about whether to build a new site with a 50 year-lifespan liquid and vapour barrier or a 100 year one. The 100 year one costs more and dents profits which dents worker pay. You’re still expecting the turkeys to vote for Christmas. It’s just a different set of turkeys. I’m not anti-codetermination at all, so please don’t get me wrong. I’m just pointing out it’s no panacea. It might help with some things but in and of itself it could also make others worse. Some of those Deustche Bank and Volkswagen board members must have known exactly what was going on and self-evidently said “we’re fine with this”. Either that, or they were insufficiency informed and / or ill-advised. So is codetermination really such a huge advance? The devil is, here as elsewhere, in the detail. Sure, in this case, we’re in agreement. Our politics have to deeper commitments to long-range planning given environmental crisis. But that’s why I think Warren’s bill must be placed within a broader platform of green new-deal — moves away from fossils, change in transit infrastructure, etc etc. State designated corporate restructure is certainly a part of that. Of course there’s no panacea in terms of a single bill. But I think the idea that workers might be short-sighted (which I know is NOT your point, but might imply it a bit) ignores the fact that “share-holder profit” mentality mostly HAS done this in re destruction of the earth. It has been short-sighted — you shall know them by their fruit. And Volkswagen did suffer a PR disaster if not a legal one. So there’s room for improvement on this front, but all is not lost. Uooh… why am I getting a flashback of Milton et al gabbing on about democracy and voters just voting themselves more money… butttt…. that is cool for the executive level and political handmaidens…. Wonder how this sits with all the gilded age scotus rulings, creating due process rights for corporate persons. And does this attack the hitherto unchallenged right of states to charter corporations? Darthbobber….I like the way you think! Re 40%. There’s about zero chance that the employees would get >=50% representation on the board, in the current US. Even suggesting so would make the bill totally out there (this is sold as nationalisation. What do you think 50% board would be sold as then?). 40% is IMO about as high as Warren could go and present the bill as having _any_ chance of something happening. TBH, there are different types of corporation, where IMO different employee representation should take place. It’s one thing to run a capital-heavy mining operation, and another no-capital-but-human SW shop. The board representation then should be driven by the requirement for capital (financial or human), but that’s a step too far for the current US I believe. What I’d say needs more looking at is what are the potential loopholes of avoiding any metrics- be it revenue or employees – and I can see empoyees as the easier to avoid TBH, via outsourcing. Revenue would hit even large outsourcers, assuming it’s not just taxable revenue, but world-wide. But that’s exactly one of those devil-in-detail points. How would you treat holding companies? How would you treat partial ownerships? What would it mean for things like investment funds, where you can own 0.5% of Apple and that part of Apple revenue is >1bln already? How would it apply to foreign corporates with >1bln of US revenue? If there was a reasonable way of dealing with those issues, making sure that corporates had a disincentive to grow over (relatively) modest scale would be a good thing in itself – as long as you also policed them to prevent informal cartels. Sure, but I want that said, and I want to hear Warren saying “never, ever” in this context. […], it has been debated whether EU freedom of establishment allows companies formed in countries without codetermination, for instance a UK Ltd, to avoid German codetermination laws. This probably depends on how politically adventurous the ECJ judiciary might choose to be because it may seem plain that the member states’ public policy exceptions would prevent this. Is EU law being used as a mechanism of transnational codetermination avoidance? Or is there a chance for the multi-jurisdictional spread of codetermination? Either way, the political dangers to codetermination are perceived as real, and before the 2013 general election this fuelled the call to legislate to extend codetermination to all foreign corporate forms operating in Germany. Sooner or later the ECJ would have had to consider this and give an opinion. Creeping codetermination is an anathema to Anglo Saxon capitalism as practiced by the U.K. (and the US). My money would be on the ECJ ruling that a U.K. company in an EU member state where codetermination is established and a EU company in the U.K. from a similar member state would be required to have codetermination. After that, it would be a slippery slope as far as U.K. business was concerned — eventually it would be, as Margaret Thatcher would have put it if she were here, codetermination by the back door. This would be an interesting one. I’m sure that ECJ would rule that an non CD entity incporporating a daughter entity in a CD state would have to follow CD rules for the daughter-co, but don’t think a non-CD entity creating a branch would impose CD on the parent entity (incorporated in a non-CD country). Similarly, a CD entity coming to a non-CD legislation would still be required to have CD at home – but not for a child entity domesticated in the other legislation (I’m sure DB has UK based legal entities, which I doubt have CD applied to them..). To do otherwise would be an extremely dangerous precedent – not just for CD, but anything, as it would pretty much cause extraterritoriality of all EU law. It would not just be that the domestic law would cease to apply – it would be a question which of the all the other EU laws would apply? If you take it a step further, it would mean that EU citizen would be followed by the law – so if you’re say a Greek, you’d be subject to Greek law anywhere in the EU, no matter what the local law says. That is, unless you have a dual citizenship, in which case who knows who could choose which law??? Interesting thoughts. I would note that flesh-and-bloods have to petition for and be *granted* citizenship, with various requirements and conditions, by the country; corporations apparently can declare their citizenship with no, or simply monetary, conditions applying. Countries can deport flesh-and-bloods that it doesn’t want, but corporations can’t be deported (‘free trade’ agreements and such). Meanwhile, a multinational corporation can choose its citizenship, and renounce any which is inconvenient to it? Has Sanders made any comment as to why or on the Warren bill in particular? Is it just “politics” (potential run for POTUS)? Ha! You are awake! Awake people everywhere on this site! I love it! Maybe companies should also have a legal requirement to clearly disclose the objectives of every lobbying effort, and to disclose the roadmap provided by lobbyists or consultants which describes how they plan to achieve these objectives. It’s hard to refute an intention to say repeal labor laws if you are legally required to disclose specific lobbying objectives. Warren’s ideas, although a step forward, are far too mild. Many of the suggestions here should be implemented as well. The reality is that we need far more dramatic reform than a few mild reforms here and there. Our system is fundamentally broken.